This is the fourth and final article in a series that explores how the Great War impacted the lives of a single family belonging to the MacKay United Church in New Edinburgh. See also Part I, Part II, and Part III of the series. Andrew Douglas Stalker was born on November 30, 1892, in Ottawa, the youngest son of George Frederick Stalker, an eminent Scottish architect who had come to Ottawa in 1883, and his wife Clarinda. Information on the family is included in the blog for Robert Alexander Stalker, which has been posted. Douglas grew up in New Edinburgh, Ottawa, attended public school there, and was very active in athletics in New Edinburgh and the city at large, especially as a football player and a rower with the New Edinburgh Canoe Club. He worked as a pattern maker and draughtsman and presumably on the basis of this training he was able to describe himself on his enlistment papers as a civil engineer. Following some service in the Canadian Army Service Corps, Douglas Stalker enlisted as a lieutenant in the 207th Battalion on April 16, 1916. Curiously, like his brother Robert he was not given a service number. The 207th was an Ottawa recruiting battalion organized by Lt. Col. Charles Wesley MacLean which included men from the Duke of Cornwall’s Own Rifles as well as volunteers from Eastern Ontario. It trained at Rockcliffe Camp, where it earned the nickname “MacLean’s athletes” because of its prowess in rugby and baseball. Douglas Stalker led the Battalion’s football team in games against Queen’s University among others. In January 1917 the Battalion moved to Amherst, Nova Scotia for further training and sailed, somewhat under strength, from Halifax on June 2, 1917. Once in England, Douglas assigned $30 a month of his overseas pay to support his mother and presumably had hopes of going directly to the front. But the 207th was broken up to reinforce other units in the field and Douglas as a surplus officer was assigned to the 7th Reserve Battalion. Not until October 6, 1917 was he assigned as a lieutenant in the 38th Battalion – an Eastern Ontario regiment in the 12th Brigade of the 4th Division – which was rebuilding after heavy losses on the Arras front. When he joined the Battalion on October 10 it was en route to Passchendaele and it reached the front line on October 28, two days after George Stalker was wounded. The 12th Brigade was on the right of the Canadian line on October 30 in the second of four set-piece battles that comprised the Canadian assault on Passchendaele. The 38th was held in brigade reserve while the other three battalions spearheaded the attack, but was nonetheless shelled heavily, and early in the afternoon B, C, and D companies were sent forward to reinforce the forward battalions. Fortunately for Douglas, his A Company was used for carrying parties. On November 5 the 38th was pulled back for a month’s rest, having suffered some 400 casualties. On December 19, 1917, the 38th returned to the Lens area and settled in for the winter holding positions on either side of the town. The rather chatty war diary describes a quiet Christmas, with snow and calm weather. “All Xmas parcels and letters delivered to men and officers in support line, including Xmas comforts of cigarettes and other presents sent to the Battn. Fraternizing with the enemy was the last thing the men would have thoughts of doing and orders forbidding same were superfluous in regard to the 38th. All ranks made the most of the means at their disposal for the enjoyment of the day, those who felt a bit homesick covering their feelings with a Camouflage of laughter and jest.” The next two months were spent moving in and out of the line, training, strengthening their positions along Vimy Ridge and enduring the usual desultory shelling, raiding, gassing, and sniping of trench warfare. On March 21, 1918, the Germans began their major offensive which pushed the British back all along the line. Before it began, there were raids on the trenches manned by the 38th by parties of 50 to 200 men, but none was able to penetrate the front line. On March 28, as the British line crumpled, the 4th Division was moved four miles south to relieve a British Division, but after Currie furiously protested this breaking up of the Canadian Corps they were moved back to Vimy where they held the line and escaped the brunt of the German offensive. In mid-May the Canadian Corps was withdrawn into GHQ Reserve for intensive training for the coming offensive, interspersed with games and sports, rest, and visits to estaminets among other places. German artillery and aircraft occasionally harassed the troops. On June 9, 1918, Douglas was slightly wounded by a gunshot wound to the face, was treated at the 12th Field Ambulance, and returned to duty. It is not clear whether this was a training accident or the result of enemy fire. News of this wound must have added to the anxiety of his mother Clarinda, who had already had one son killed and another badly wounded. On July 22 he was given fourteen days’ leave in England, and when he returned in early August the 38th was moving into position for the Amiens offensive. The lead Canadian Divisions jumped off at 04:20 a.m. on August 8, 1918, and exactly one hour later the 12th brigade followed in the wake of the Third Division, moving quickly across ground already taken, with only light artillery fire. By nightfall they had advanced 13 km. into enemy territory. In the small hours of the next morning the 12th Brigade moved forward to the village of Rosières and prepared to continue the attack. The 72nd and 85th Battalions led, with the 78th and 38th in support. All, went well until the 85th became bogged down in a zigzag of old trenches, facing heavy resistance and artillery fire, and with their flank exposed because of the slower advance of the Australians to their left. Instead of resting and refitting, the Canadians were moved to the Arras sector to commence, with minimum preparation, the offensive that would lead them to Mons and the end of the war. The 38th saw some action on August 30 and September 1, but the 4th Division’s major role was in the battle to break the Drocourt-Quéant Line on September 2. The 4th Division was on the left of the Canadian line. After the 10th Battalion took the town of Dury, the 12th Brigade, with the 38th Battalion in the centre, passed through to take on the toughest portion of the German line, with little artillery support. Stalker’s ‘A’ Company was one of two in the lead. After they took their objective and another battalion had passed through them, “A” and “B” companies reorganized and pressed the attack until the concentration of defences against them became too great to allow further advance. They then dug in, having captured 325 prisoners, four trench mortars and forty machine guns, and suffering relatively light but nonetheless sobering casualties: three officers and 57 other ranks killed, seven officers and 176 other ranks wounded and 57 missing, for a total of 300. It is unlikely that Stalker was involved in the subsequent actions of the 38th because on September 29 he proceeded on course to the 1st Army Infantry School, from which he returned on November 4. By this time the 38th was resting following the battle of Valenciennes and it was in billet at Anzin when the Armistice was announced on November 11. Unlike his two older brothers, Doug Stalker had had a relatively “good” war. He had seen plenty of action and suffered his share of horror and privation, but he had emerged at least physically unscathed. He was, however, about to fall victim to another peril of the war. On November 15, 1918, Douglas was sent to the 20 General Hospital, Camiers, then to 51 General Hospital, Étaples, for treatment of scabies and gonorrhea. Treatment took almost two months and he did not return to duty until January 12, 1919. His place in the 38th had been taken by another officer, so he proceeded to England to serve with the Eastern Ontario Regimental Depot at Seaford. He then joined District Department #3 at the holding camp at Kinmel, Wales, near Liverpool. There in an unbearably cold, wet, winter, with overcrowded camps and badly managed logistics, Canadian soldiers rioted on March 4-5, with five men killed, 25 wounded, and many court-martialled and sentenced to prison terms. Stalker sailed on April 3 on the S. S. Lapland from Liverpool. He was discharged in Ottawa on April 14, 1919, with no disabilities, a healthy 5’10”, 172 pounds, with a pulse rate of 72. Two other brothers who had not joined the forces continued to live with their mother at 37 Charles Street in New Edinburgh. Arthur Stalker, also an athlete, became a carpenter and continued to attend MacKay United Church until he died at 65 in 1954 of acute bronchitis, leaving a wife and one child. Moray Stalker, who had managed the affairs of his brothers abroad and his mother at home, rose to the position of Assistant City Clerk. He does not seem to have married and when he retired he was described on a 1949 voters’ list as “gentleman”. He died in 1970, the last of the nine children of George and Clarinda Stalker, and one of only two who had not in some way fallen victim to a foreign enemy – the Great War – or to a more insidious domestic one – tuberculosis. ALAN BOWKER served for thirty-five years in Canada’s foreign service, including as High Commissioner to Guyana. He has a PhD in Canadian history and has taught at Royal Military College. He lives in Ottawa. His latest book is A Time Such as There Never Was Before: Canada After the Great War. 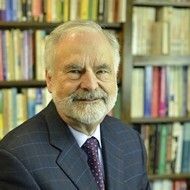 He has also edited two collections of essays by Stephen Leacock, whom he considers one of the most perceptive commentators on early twentieth-century Canada. Ottawa Journal 12 October, 20 October 1916. Cook, Shock Troops, Chapter 22, and War diary of the 38th battalion, especially entry for 30 October, available online. 38th Battalion War diary Appendix I to August diary, and subsequent pages. Clipping provided by a descendant. Ottawa Journal, September 30, 1937: “A. D. Stalker Was Popular Civic Official Death Occurs of Waterworks Engineer”. The fact that Arthur Stalker died of a lung disease also raises the possibility that TB was a factor. There is no way to know whether the lives of George or Douglas Stalker were shortened by the war, but it is a reasonable supposition, particularly in George’s case. This is the third in a series of articles exploring how the Great War impacted the lives of a single family belonging to the MacKay United Church in New Edinburgh. See also Part I and Part II of the series. George Frederick Stalker was the older brother of Robert A. Stalker. He was born in London, England, on January 18, 1877, the eldest of nine children of his namesake, eminent architect George Frederick Stalker and his wife Clarinda, who came to Ottawa in 1883. When George Sr. died suddenly in 1895 Clarinda was left with nine children. All four daughters died young of TB or respiratory disease. Clarinda was a member of MacKay Presbyterian Church and very active in its Ladies’ Aid. (George Stalker in his Cameron Highlanders militia uniform. Photograph provided by a descendant). When war broke out George—as a 37-year-old with three children and a career—would probably have been considered unsuitable for overseas service. Nevertheless, he served from July to September 1915 as an internment guard with the 107th, presumably at one of the camps set up in the BC interior. Then in early 1916 he attended the Royal School of Infantry in Victoria for five months. By this time restrictions on recruitment had been relaxed and on May 19, 1916, George, now pushing 40, resigned his commission and enlisted with the 196th (Western Universities) Overseas Battalion, CEF. He was 5’ 10 ½”, ruddy complexion, with blue eyes and iron grey hair. Perhaps even more than with his brother Robert, we might well ask why a middle-aged man with small children was so eager for overseas service in what was by now well known as a dangerous war? In joining the military George had also given up his employment. When his battalion was sent overseas in November 1916, George sent his family $20 a month from his pay and they also received a $20 separation allowance. But this would not have been enough, and Clara and the children (6, 4 and 2) had to find someplace to live where they could be supported by family. She and the children moved first to an apartment in Winnipeg and then, about December 1916, moved in with her mother-in-law, Clarinda Stalker, at 37 Charles Street in New Edinburgh, Ottawa. She would have been there when news was received of Robert’s death at Vimy Ridge in April 1917. The 196th Battalion arrived in England on November 11, 1916 and was promptly broken up. On New Year’s Day, 1917, George was assigned to the 19th Reserve Battalion as a Lance Corporal. He was made acting Corporal but then reverted to the ranks to proceed to the front. On April 25, 1917, a little over two weeks after his brother’s death, he joined the 46th Battalion (South Saskatchewan) in the 4th Division, likely as a replacement for losses at Vimy. He may have seen action at Hill 70. He was promoted to Corporal on August 21, 1917 and Lance Sergeant the following day. In the fall of 1917 the 46th moved to the Ypres Sector to prepare for the attack on Passchendaele. In the first of four set-piece battles, on October 26, the 46th Battalion had the difficult assignment of taking Decline Copse, a section of ground protected by trees and at least ten pillboxes, where attack could only be along a narrow front because of mud and water on each side. The Battalion pushed off before dawn under a heavy rolling barrage which offered some protection but further churned up an already porridge-like battlefield. Before long the men, slowed down by the mud, were easy targets for the enemy. The artillery support faltered as the guns kept sinking into the mud and fired short into their own troops, who were now being shelled from both sides. Only incredible heroism by some of the survivors enabled the 46th to take its objective. It was then exposed to heavy enfilade fire from both sides, and more heroism was required to hold the position until reinforcements arrived and they could then retire to a defensible line. At some point in this battle George Stalker sustained shrapnel wounds to his arm, shoulder, and back, the most serious of which shattered bones in his right hand. George was evacuated to a field hospital and then to the No. 3 General Hospital in Le Treport, where his hand was X-rayed and the shrapnel surgically removed. His hand swelled up and for about a week he ran a temperature, but there was no serious infection. He was then evacuated to England and on November 6 he was admitted to Bath War Hospital where he recuperated and regained at least some of the use of his arm. On April 24, 1918 he was sent to the No. 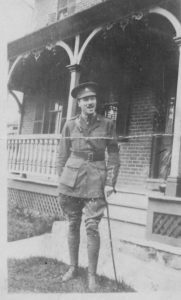 13 Canadian General Hospital in Hastings for convalescence, until on September 20 he was discharged to Canada as unfit for further overseas service. After a short stay at the Queen’s Military Hospital in Kingston he was transferred on October 19, 1918 to the Fleming Hospital in Ottawa, the mansion of Sir Sandford Fleming, which his son and his wife had donated as a 71-bed convalescent home for wounded soldiers in the final stages of recovery. Here the military discipline of hospital life was relaxed and he could see his family during the day. Besides completing his medical recovery he received dental treatment including new plates, which appear to have been sorely needed. (A page from George Stalker’s medical report upon discharge. From his CEF personnel file). Following his discharge from active service on February 5, 1919, George stayed for a short time with his family at his mother’s home in New Edinburgh, then moved to another house nearby. He was taken on strength as a Staff Sergeant (later Quartermaster Sergeant) at the Corps of Military Staff Clerks at Militia HQ in Ottawa, in a records section dealing with pay, rations, discipline, and clothing. He bought a $200 Victory Bond. When this work was transferred to the civilian public service he was discharged as medically unfit on January 31, 1920. (George Stalker’s obituary. From the Ottawa Journal). Restricted movement of right hand – flexion of all fingers impaired – 3rd finger worse – extension of first finger impaired. Extension of the wrist beyond a straight line impossible. Flexion of the wrist to a radius of 30 degs from a straight line with arm. Grip of thumb and index finger fair, remainder poor, impossible to close hand beyond 1/4 of normal. Can use pen with restrictions. After his discharge Stalker was transferred to the forerunner of Veterans’ Affairs to continue the work he had been doing at Militia HQ, and later served for twenty years in the Records Branch of the Department of National Defence, becoming head clerk. About 1921 he and his family moved into a modest but comfortable house in a neighbourhood that had opened up in Old Ottawa South, near the Rideau River and not far from where Carleton University is today. He became a prominent member of the St. Andrew’s Society and transferred his religious allegiance to become an active member of Holy Trinity Anglican Church. [i] Information, and the picture of G. F. Stalker, was provided by a descendant. It may be of him in later life in his militia uniform. [ii] Information on military service is found in his service record and attestation papers. [iii] Ottawa Journal, June 7, 1940, page 5, “Major G. F. Stalker Dies in 64th Year”. After being the High Commissioner to the Sultanate of Brunei Darussalam (and it doesn't get any more exotic than that), I retired to my home town Vancouver and a job at the Canadian Education Centre Network a private non profit company supported by DFAIT and mandated to promote Canada as an education destination to international students...an activity near and dear to my heart. When the CECN began to lose it's way I left...it went out of business about a year later. Almost immediately I began to be contacted by former CECN overseas managers who asked me to put together education familiarization tours. Over the past 9 years my wife Suchitra and I have traveled to all 10 provinces with groups of educators, education agents, media reps all of whom are interested in learning more about Canada's education system both K-12 and post secondary. We have had small groups from India, Malaysia, Indonesia, Nigeria, Vietnam, Libya and larger group tours I organize on behalf of the Canadian Accredited Indpendent Schools (CAIS). I do the promotion of the tours to prospective participating school here, organize all the logistics (including meals - see below) and assisted by my wife Suchitra, lead the tours throughout Canada. It is quite tiring but great fun. This is the first in a series of articles exploring how the Great War impacted the lives of a single family belonging to the MacKay United Church in New Edinburgh. After the Remembrance Day service at MacKay United Church in Ottawa in 2014, in which the names of those who had fallen in two world wars were read out as they are every year, Tim Cook suggested to me that as we were now marking the 100th anniversary of this terrible conflict it might be more meaningful to provide some more detailed information on the lives of these soldiers, since their service records and other information like the Circumstances of Death Registers were now available online. It would not only be a more fitting tribute to the men, but would bring to life the ordeal of those sitting in the same pews a century before, as they waited for news and prayed for deliverance. I remember reading a bumper sticker once that said, “ Hire a teenager while he still knows everything “ . Well, I was a bit like that once and never more so than in Dr. Scammell’s English class. I was reminded of this during the recent 50th anniversary reunion of my Montreal high school graduating class when I walked right into Dr. Scammell’s old classroom. In the manner of Addison’s and Steele’s 18th century “Spectator”, I – a playful pup of some perspicuity - am resolved to analyze my present situation and set down some resolutions in the hope such publicity will strengthen my purpose. Being myself a creature of strong zeal and weak intellect, I am happy to remain in the custody of my masters on Eastbourne Avenue, with the caveat that their behavior evolve as favorably as I expect my own to do. While much of my education about pop culture in the 21st c. is provided by my 12-year old grandson during our early morning walks with his dog, Canadian history is not one of our hotter topics . Recently, however, a passing question about the settlement of New France led me to dig around and discover several little known events in our national story. In their travels many Just Ottawa readers will have come across some interesting off-the-beaten-track festivals, often in foreign lands. Here is one I recently stumbled upon just a few miles south of Pembroke in our own Ottawa Valley. I have always loved lilacs. Every year Malcolm and I go back to the farm in late spring to gather an armful of branches from the thick cluster of lilac bushes that had embellished our log cabin at the end of Flood Road along the Rideau Trail in the south west corner of Ottawa. Now only an outline of the foundation remains of the 500 square foot storey-and-a-half log building that had been built by Adam Baker in 1843. After our ownership ended, hunters or vagrants burned it down. The story of our drive through Northern Botswana starts with a footnote from a travel guide.